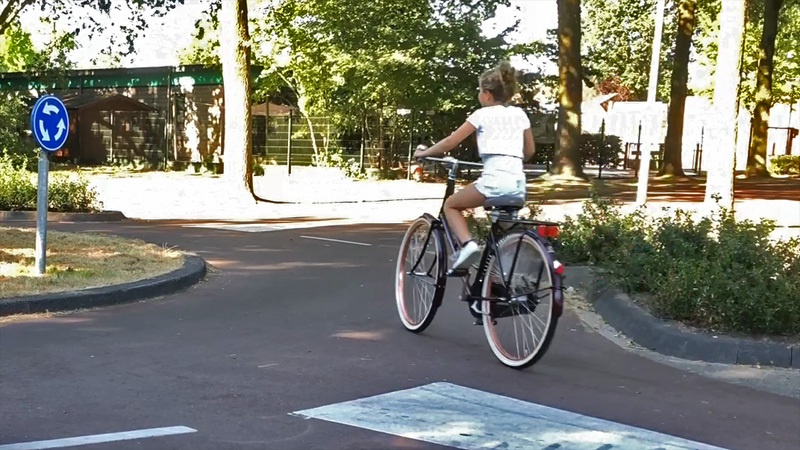 The town of Boxtel has a most peculiar piece of infrastructure; a bicycle roundabout. It is silly, mainly because it is never a good idea to treat people cycling like mini-cars. This piece of infrastructure entices people to break the rules. Because when you turn left going against traffic is so much more convenient than following the mandatory riding direction around this roundabout. All but one of the people I saw going left went against traffic. The one person who didn’t was laughed at, by his own wife most likely! Going against traffic is potentially dangerous and yet the roundabout was built to improve cycling safety. Can we find out why? The bicycle roundabout in Boxtel. People who went straight-on did follow the mandatory riding direction, as do the ones going right. It’s the left-turns that are problematic. 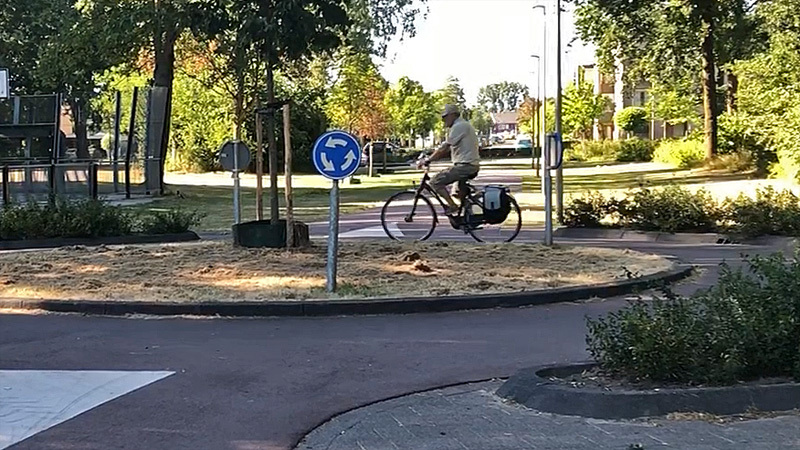 The bicycle roundabout in Boxtel turns out to be but a small part of an elaborate reconstruction plan. 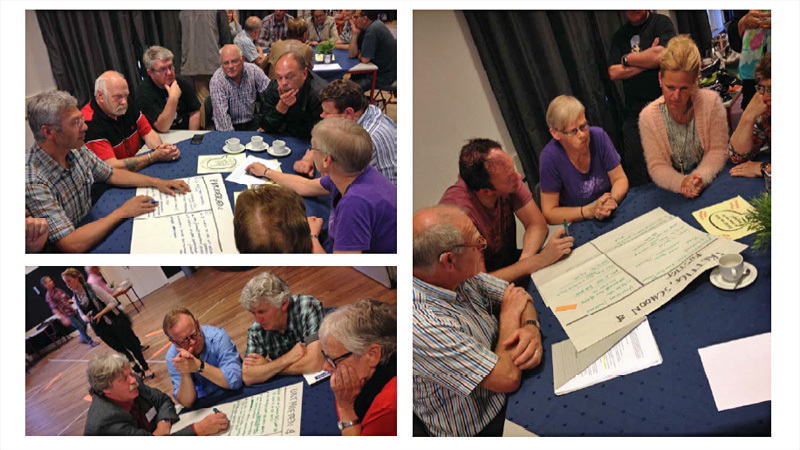 The municipality of Boxtel combined several goals and policies to improve livability in a good part of the town. 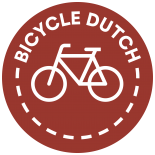 Boxtel has a cycle policy, it dates from 2010 and goes by the name of “Boxtel Bicycle 2010 – 2020” (That’s right, in English, I don’t understand either.) The aim: increasing cycling by 4% in the period from 2010 to 2020. That may sound like a very modest goal, but it would take the modal share of cycling for in-town trips from 39% to 43%. The latter would be in line with towns of a similar size, such as Culemborg and Raalte. It is quite difficult to increase a modal share when it is already as high as 39%. You would have to build really impressive infrastructure to persuade people to take up cycling who do not already belong to the early adaptors. 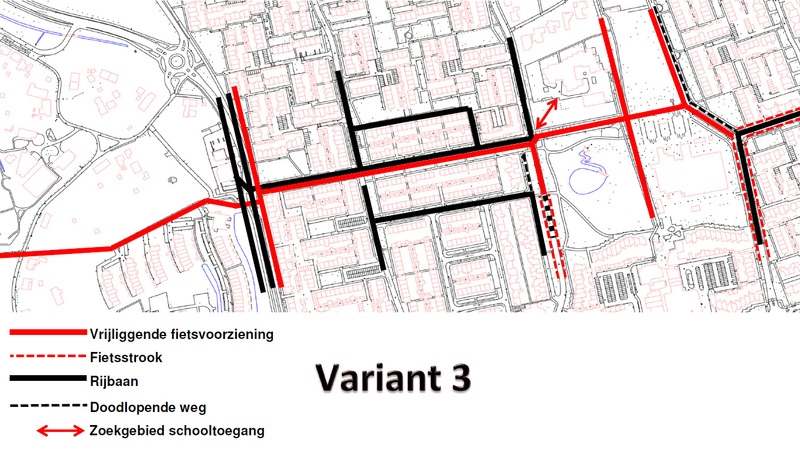 Boxtel needed to renew a main sewer system in a street that could be a key street in a new main cycle route. In line with the cycling policy the town decided to combine the cycle ambitions and this sewer renewal. If the street was to be opened anyway why not reconstruct it completely? The street was also the location of one of the town’s black spots. A site with a high number of traffic incidents, that could be dealt with at the same time. Then there is a primary school that could do with a safer route to reach it. A good cycle route here would connect new neighbourhoods much further away too. Finally, the green zone was a bit tired, the park could do with a refreshing update. While I filmed here, all but one of the people making a left turn did it like this: going against traffic. In 2014, the council started an elaborate process to tackle all these projects in one big reconstruction plan. The residents and other stakeholders were invited to take part in the decision process from a very early stage. The council’s ideas were presented in two community meetings in June 2014, where the town’s objects were explained together with possible solutions. The residents could have their say, these nights, and later via social media as well. Their remarks were indeed considered. How exactly was explained in another community meeting in December 2014. Again, the stakeholders had the opportunity to comment on that presentation. The plans were after all quite elaborate, even involving completely closing a street to motor traffic. The reactions to the accumulated remarks were processed and the council presented a preliminary design in July 2015. Remarks about this design were again taken into account and that led to a final design, presented in September 2015. The changes of the Traffic Order were announced in February 2016. The reconstruction took place in the summer of 2016 and by the autumn of 2016 everything was finished. The roundabout as I found it in July 2018, nearly two years after it was constructed. 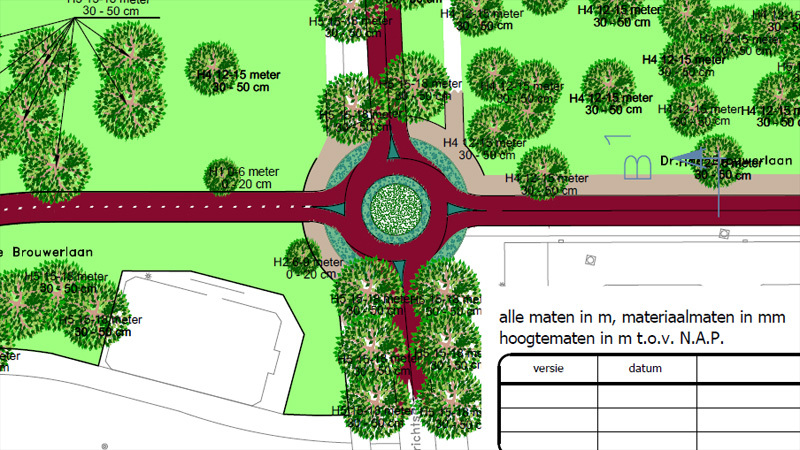 I agree that it was not a good decision to build the bicycle roundabout in Boxtel. 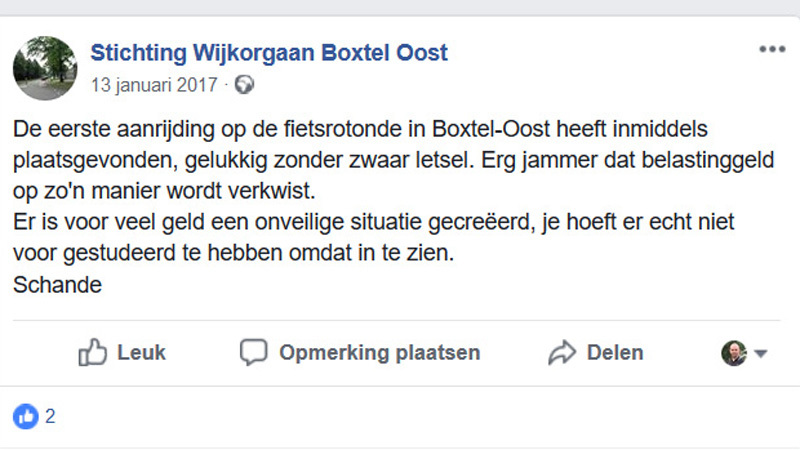 A shame, because Boxtel does do good things for cycling. Errors are made, in this country too of course. The Dutch can’t do everything right. That can lead to silly roundabouts. We had one in Sint Michielsgestel, there seem to be examples in Leiden and Delft too and this is yet another one. One can only hope there won’t be more! The Bicycle Roundabout in Boxtel. I think this would only work if it was busy enough; if the road was clear I too would cut across to turn left. 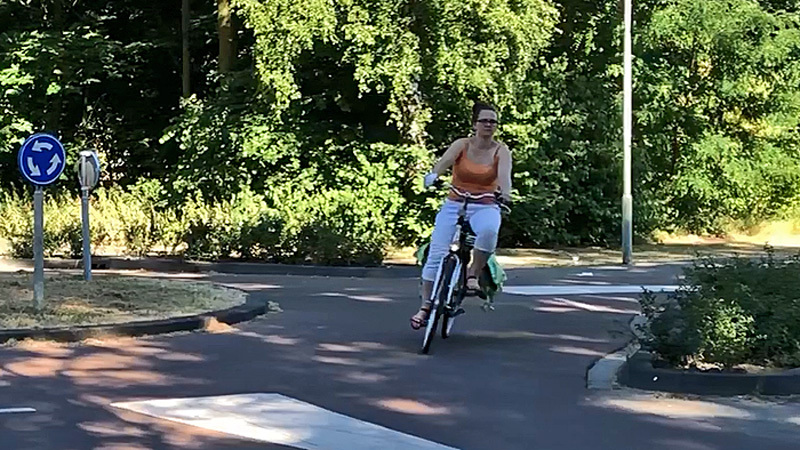 Incidentally, I wondered something similar about your recent post regarding the new cycle bridge in Zwolle; here cyclists have no choice but to cycle the loop round rather than taking a more direct route, perhaps at a steeper gradient. It looks daft but I do wonder if the roundabout might be more useful with higher volumes of cyclists – ie in the rush hour or similar? Surely roundabouts on the road only exist to manage higher levels of (motorised) traffic? Of course a cyclist who is alone on the roundabout is going to take the short cut. I doubt that a roundabout would be useful in high bicycle traffic levels. It’s definitely not necessary, see this previous post https://bicycledutch.wordpress.com/2014/11/20/can-there-ever-be-too-many-people-cycling/ linked from the post (and at that time the junction was under construction, thus more chaotic than usual). I like a comparison I once read somewhere: cycling has as much similarities with walking as it has with motorised traffic, so if the transposition of a concept to one of these modes doesn’t make sense, then it might not make sense for cycling either. In this case a roundabout for pedestrians sounds pretty weird to me. Even worse. When you are cycling on the roundabout you have to give way to the people on the right because I don’t see any ‘shark teeth’ for them. It is actually just an normal intersection without priority with a but obstacle in the middle. #facepalm. Hence why, on streets used by motor vehicles, that the approach splitter islands are made of solid raised concrete and not just paint-on-asphalt. I remember a juvenile delinquent driver in the 1970’s who regularly used to cut the corners when turning right at roundabouts with only painted splitters were first installed in the low-trafficked streets of his local neighbourhood in South Australia. How he lived to survive to today is just down to pure luck! This one does not have roundabout signs, but is still uttterly useless. That’s weird, especially for Assen. Perhaps there’s a hunebedden underneath it they didnt want to disturb. 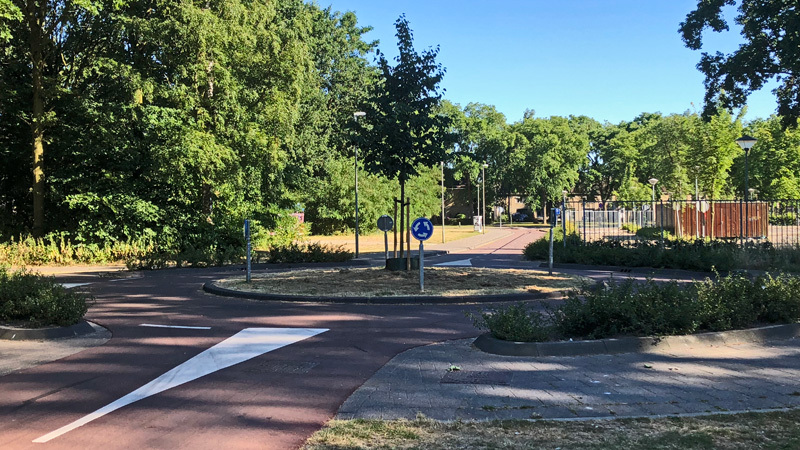 This entry was posted on 24 July 2018 by Bicycle Dutch in Original posts and tagged Boxtel, exceptional cycling infrastructure, NL is not perfect, roundabout.